When you look up the name Jay Cutler on Google, usually the first result that comes up is the professional bodybuilder and not the Chicago Bears all-time leader in every passing category. Just as Google’s search engine looks at Cutler, the Bears quarterback is an afterthought to most critics and other NFL players. But, this will be Cutler’s season where he will be the one joking and smiling, which he does do quite often, at all his doubters after he has a career season. The Bears have a new offensive coordinator, but the offense will not have the drawbacks of having to learn a completely new system, as Loggains will look to keep things similar to how former offensive coordinator Adam Gase had them a season ago. Finally, a year Cutler doesn’t have to learn a new playbook, with new verbiage, and can now master the offense. But, there will be some changes, hopefully, one being not as many bubble screens. It’s not just the similar offense that will help, but the relationship between Cutler and Loggains will also be key throughout the season. Right guard Kyle Long sees a lot of the two in each other. “It’s like Jay and Mini Jay in the building,” Long said. He also went on to say that Loggains and Cutler are both really competitive, smart, and have good communication with each other. Cutler and Loggains have a strong relationship and during the high and most importantly the low parts of the season will have to rely on that relationship to move them in the right direction. This season Cutler will have plenty of options to either hand the ball off or throw to. The one option most fans are looking forward to is last year’s first round pick, Kevin White. With White on the opposite side of Alshon Jeffery, you have two receivers who can take the top off a defense and make big plays down the field. Opposing team’s defenses will have to focus on Chicago’s big receivers and this opens the field up for the third primary target tight end Zach Miller. Cutler and Miller had good chemistry with each other towards the second half of last season and now with Miller as the full-time starter, it should be fun to watch how the two build off that chemistry. Then there are players like wide receiver Eddie Royal and running backs Jeremy Langford and Ka’Deem Carey, who will look to have more of an impact on the offense this season. Cutler elevated the play of whatever weapons were on the field a season ago and will look to do the same with the core he has around him. In a recent interview Stacey Dales, who is a host for NFL Network, interviewed Cutler and it started with Dales talking about the 11-year pro’s physique. Cutler said he is heavier than he has been in the past three or four years. “I just want to make sure I had enough armor to make it through the season,” Cutler said. Cutler knows what an NFL season can do to his body and has made the right changes to help him get through an entire season. Last season under defensive coordinator Vic Fangio, the defense made strides in the right direction. Now, the Bears have added a few more playmakers who should help create more turnovers and give Cutler and the offense more opportunities to score. The defense only had 17 turnovers a season ago. Having a veteran quarterback, like Hoyer as a backup, who has worked with Loggains in the past is going to help Cutler throughout the season. Hoyer will help Cutler out with reading defenses, giving his opinion on what he sees on the field, and just be someone Cutler can trust. 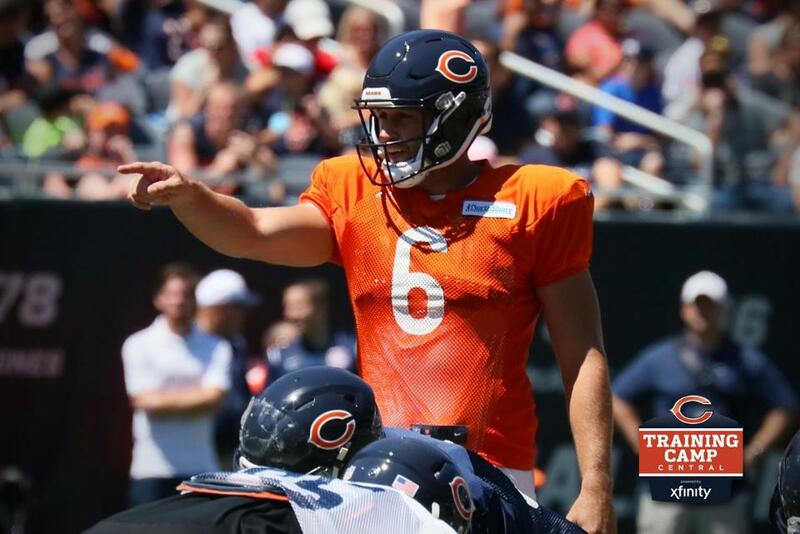 Look for Cutler, Hoyer and Loggains to be hanging out a lot while they are on the sidelines, until the next time the offense is ready to take the field. You should give a damn about Cutler because nobody ever does. At the start of each season, there are always negative comments about Cutler. ESPN personality Stephen A. Smith already had a strong comment about the Bears’ quarterback. “Jay Cutler is the worst quarterback in the NFL,” Smith said. Smith wasn’t the only one who had outrageous comments about Cutler. Martellus and Michael Bennett both had some words to say. “Worst quarterback in the NFL,” Seahawks defensive end said. Martellus, who was never a pro bowler before teaming up with Cutler, critiqued his old quarterback. “I’d be open and he’d throw into double coverage,” he said. Of course, the veteran quarterback didn’t backlash and make some rude comment. That’s just not who he is as a person. But, Cutler is already written off and considered an afterthought at the start of each season. Give a damn about Cutler, because when he is on pace for a career year, we know he won’t give a damn about what anybody is saying about him.